Cain leads the field with 20 percent but is in a statistical dead heat with Gingrich, who gets 19 percent. Romney gets 14 percent. Only 9% say they're "definitely" voting for Romney. It goes to show you the transient nature of 'inevitable'. Romney's "inevitability" is mostly wishful thinking at this point. Bunch of animals. Motherfucking grunting neanderthals. These people need to be on the unemployment line, ASAP, and I’m writing a letter demanding that action. That's about the police, mind you. Now, I oppose police brutality (even against transients--which most of the O-town OWS appear to be), but the police are in a difficult situation and have had bottles/trash thrown at them,etc. There are mentally people out there just going insane. "Byro"'s stupid insults and rants are thus completely improper--if not verging on a crime-- and he should be exposed. The druggie freak's a businessperson in Sacramento. Here's his cheesy mail order site. Git 'er done. Oh God, not Newt. A fat, rich, old white guy against Obama. Just write off the country right now. Can't say I'm sorry to see Mittens going down in a blaze of infamy. Most conservatives are saying Cain is finished, yet he still leads, though slim. This is showing that the GOP is just as out of touch with the people as the Dems. You go to war with the army you have. They're all richer and older than Obama. Among the non-Romneys, Gingrich might have the best chance of beating Obama. Let us hear it for Gewt Ningrich. Oh let him be the RepublicanT Party candidate. Please. Just think of all the reasons to vote for Gewt... .
Get out there and vote on 7 November 2012 for Gewt Ningrich; he's from Georgia. RK - Guess there is no shortage of "the lesser of two evils" vying for the big R nomination. Damn we're in trouble as a nation. @Ema Nymton: Are you cheating on me, girl? Come back home to the LAS blog. I'm following #Occupy garbage collection operations. I like Not-Romney's chances as of today. No, it just goes to show how early it is and how many candidates are still in the race. Polls now mean nothing unless we have a full preference ordering among all candidates (and not voting as an option). As candidates start dropping, their supporters will pick someone else and the numbers will change. Endorsements of the losers might matter. Early primary victories may or may not matter. The race is in its first furlong. The advertising hasn't even begun yet. Cash starved candidates will be dropping like flies soon. Im happy to see Gingrich rising, but i think he suffers from too much Bob Dole syndrome. If he wins, I fear we will relive 1996. 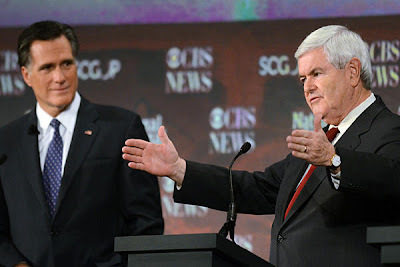 If we could transplant Gingrich's brain into Cain's body with Romney's budget, I think we would have a winner. Les, I wish we had no-evils running. Apparently you have to be at least moderately evil to be a successful politician which is why I won't become one. Politics itself is sad. We get two kinds of candidates: the rich and the worthless. Some are both. Wanting to run is almost a disqualification. Yes, we're in trouble. When we elected Obama, I almost gave up hope. That Obama's approval numbers aren't in the low teens concerns me greatly. And I get no comfort from the state of the GOP. The Republican party is unprincipled and rotten to the core. Little has changed over the past several years. Republicans haven't learned the lessons of 2006 and 2008 because they don't want to learn them. They LOVE watered-down statism. They offer themselves as nothing more than a semi-competent alternative to the socialist buffoons of the Democrat party. They lead from behind. I don't know what the current crop of Republicans will do for us, except maybe they'll slow down the destruction just a little bit. I suppose in some ways I'm incurably optimistic about our country, but optimism isn't entirely rational because most of the evidence would suggest that "Morning in America" is over. So here we are... probably stuck with Mitt, Perry, Newt, or Cain. As far as I'm concerned, Mitt's a moderate Democrat. Where I live, Democrats are often at least as conservative as him. Same for Perry. He'd make a fine Democrat governor in my state. Maybe he should go back to Gore. Gingrich is a big-government moderate with some conservative tendencies. He can be an idiot, but at least he almost always knows what he's talking about. And I think a conservative Republican congress could keep him in check. It might not be easy, but it's probably doable. I'm quite sure he won't be given the leeway that Bush Jr. got. My biggest worry on Newt is that he seems to yearn for approval from all the wrong people. He'll be too easily swayed by the MSM. But I've been slightly reassured by his willingness to attack the MSM lately. We'll see how long that lasts. Probably not long. Cain is Cain. WYSIWYG. At least his heart seems to be in the right place most of the time. But I'm no longer willing to try to believe that he's "in it to win it" as he so often tells himself. I'm convinced that he as at least as intelligent and competent as Barack Obama, and he can communicate at least as well off tele-prompter, but unless he develops the communications skills of a Ronald Reagan and the IQ of a Newt Gingrich, there's no way the MSM won't annihilate him on the way to the White House. There's just too much at stake. If the Democrat party looses 25% of the black vote, Whig-esque extinction will be just around the corner. So I think the smart money is on ROMNEY and NEWT at this point. Perry shows little in the way of any rebound potential. My apologies to anyone who has their heart set on the other candidates, but I don't think any of them will make it. I'll eat my hat if they do. Mark my words. If Newt flounders, Mitt gets it. Having said all that, and having gone on record as being adamantly opposed to Mitt the socialist-lite moderate Democrat, I'm beginning to lean to Newt at this point. He's only modestly better than Romney, but I'll take what I can get. Mike Pence and Nikki Haley aren't running this year. How is Newt Gingrich better than Romney? When it comes to Gingrich, I'm a homer. He's a genuinely good guy, but he's in a bad position rhetorically. Sadly, that's what matters most. I think one thing Romney has on his side is that most of the digs at him from the right are hyperbolic in nature. Say what you will about the health care thing, it was done with the overwhelming support of Massachusetts voters. If we're going to start faulting our candidates for responding to the people who elected them, we probably ought to reexamine where we are. Gingrich would be hard to defend from the right because of a whole litany of things that are simply hard to defend on their face. Screwing around on his wife while overseeing Clinton's impeachment, acting as a lobbyist while railing against lobbyists, etc.. I'm not saying there's anything indefensible there, but it's a rhetorical tar baby that would be his undoing in a general election in my opinion. Romney, on the other hand, has nothing to apologize for. I prefer Perry, but Romney is simply better at this than anyone else running...including the 135 pound sewer rat who currently occupies the White House. For what it's worth, I think Gingrich is simply vying for a place in the next administration so he can be an active part in undoing the unprecedented evil visited upon this nation by brakabama and his ilk. That's the kind of thing that really gets his motor running. He really is a process guy more than an ideologue. He's pretty brilliant in that arena too. He gets criticized for being unprincipled but that's mainly because he dismisses radical changes as being too disruptive to the nation...or the people. I can respect that kind of pragmatism because it at least acknowledges the source of the problem. That being government intrusion into the marketplace.